Cornerstone's Young Adult Program (YA) is designed specifically to treat 18 to 25 year olds struggling with substance abuse or chemical dependency. Far too often, youthful experimentation quickly spirals into addiction, and young people find themselves in the grips of a drug problem before their lives have truly begun. 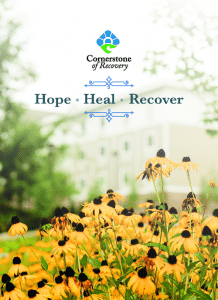 At Cornerstone of Recovery, the Young Adult Program is specifically tailored to those between the ages of 18 and 26. Like all of our treatment paths, it’s accredited by the Joint Commission on the Accreditation of Healthcare Organizations (JCAHO), and it offers recovery tools based in both tradition and academia, all of them specifically designed for young minds, bodies and spirits. In the Young Adult Program, we recognize that young people require something more than just traditional drug rehab. Their emotional experiences are more intense, their energy levels are higher and their drug use has often left them floundering mentally and spiritually. With Cornerstone’s whole-person approach to treatment, we tailor each patient’s program to meet his or her specific needs in groups that will include traditional 12 Step work, daily activity therapy, fitness programs in our on-campus fitness center and ropes course and group therapy with trained clinicians and counselors who often are in recovery as well – some of whom found it as young people themselves, in the very facility in which they now work. At the same time, our licensed medical staff members will work with co-occurring disorders that often plague young adults, including ADHD and anxiety, which often present as life traps alongside addiction. Outside of the day-to-day routine, patients in the Young Adult Program will take part in family therapy exercises that treat parents and siblings as well; too often those family members are themselves sick – with worry, with fear, with frustration, with anger – and in order to provide a supportive environment into which Young Adults can return after treatment, we want to help those affected by their addiction find hope as well. What’s the Young Adult Program like? They trample and trudge into group therapy on a cool spring morning with the exuberance of a herd of wild palominos. There’s plenty of juvenile humor and masculine posturing among the assembled group of young men as they clamber into chairs arranged in a circle. One grabs the dry erase board, another shoves a granola bar into his mouth before the therapist reminds him that food isn’t allowed, another begins riffing on a particular counselor’s deep Southern accent. After a few minutes, however, they begin to settle. Counselors with the patience of Job gently steer them toward the goal that has brought them to Cornerstone: treatment of addiction to drugs and alcohol, and examination of the underlying issues that precipitate it and coincide with it. They’re hesitant at first, eyes crawling the walls and the woods outside the window as the pain they carry bubbles up from places deep within, the black swamps of wounded souls and shadowy valleys of broken hearts. For many of them, they’ve spent the majority of their young years denying themselves permission to feel those things, and so they come to Cornerstone driven by only the most primal of emotions. Rage, sadness, lust, disdain … those visceral feelings are a reaction to the stimuli around them, the people and places that drive them into self-protective cycles of using to live and living to use, and it takes time and tolerance by specially trained staff members to break through the walls they’ve erected in their lives. And with the help of that family, as well as the extended network of counselors and clinicians, they’ll begin to discover who they really are and what they really want. Our Young Adult Program treats the addiction, but it also helps patients begin to answer those questions. Patients can, for the first time, see life with new eyes, and the light they find is one that burns bright from within instead of one that beckons with false assurances and often ends in trauma and tragedy. At Cornerstone of Recovery, the staff members of our Young Adult Program find themselves renewed and invigorated by helping patients find that inner light. Call today, for yourself or a loved one, and let them help that journey begin.